A reader just sent this in . 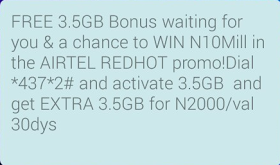 Airtel is giving 100% bonus when you purchase a data plan of N2000-3.5GB. This simply means that you’ll get an extra 3.5GB for subscribing. Making it a total of 7GB. Kindly Dial *437*2# to activate the Airtel 7GB for N2000. The data is valid for 30days.